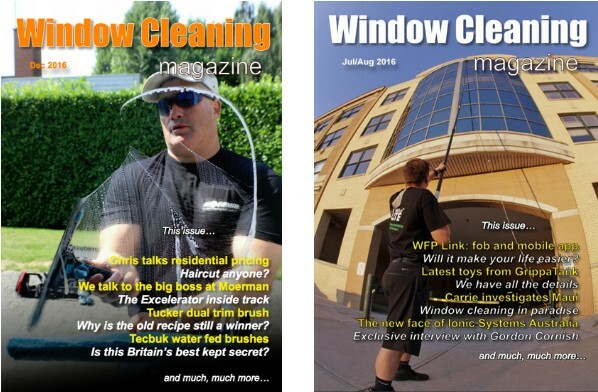 The Window Cleaning Magazine is the leading magazine for professional window cleaners in the UK and Worldwide. The magazine is packed with content including reviews of new equipment and articles specifically aimed to help owners of window cleaning companies to improve their business, plus news relevant to their industry. Window cleaning scam – be careful! Once again fraudsters have been posing as window cleaners in order to con local residents out of money, this time in Huddersfield. In a recent report published on the ITV news and their website, a man “got away with cash after tricking one resident in the Lockwood area”. Apparently the offence “came to light when the genuine window cleaner called asking for payment” which is hardly surprising, but why are residents so easily duped? The report goes on to say that there have been similar incidents in the area and “police believe others may not yet have come to light”. A description of the fraudster described him as probably being “in his twenties, 5ft 8ins tall, white and of average build”. Also “He has dark coloured short hair and stubble and wearing a dark coloured jacket and blue jeans”. We advise all customers to make sure they know who their window cleaner is by sight, as well as their staff. If someone comes to your door and you don’t recognise them then ask for identification first if they request a payment. If in doubt, refuse payment until they can provide proper identification, or ask them for an address to send payment to. Better still, ask them if they have a website where you can pay your bill onlne. Or a bank account where you can transfer money too online. Most professional window cleaners these days can provide these payment options. Virtual window cleaning – good clean fun? Will the virtual reality game ‘Pane in the Glass’ prove to be popular with users of the HTC Vive headset? Possibly. Will it be a useful training aid? Doubtful. But either way, it could be one of the of the first free games you download for the Vive. If you want to learn more about this new device showcased at the VRUK festival 2016 at Ravensbourne, check out the link below. Members of the Quality Window Cleaning network are happy to provide additional cleaning services other than window cleaning. The future of window cleaning may be just around the corner. A new ‘Window Washing Robot’ is being sold on a gadget website for $399. It’s being described as being “the world’s first robot which will automatically clean any glass surface that you place it on, regardless of its thickness”. Apparently it works by using a powerful internal vacuum pump which seals it onto the glass to stop it falling off. Using two motors to drive the anti-slip treads, the robot will be able to go about it’s cleaning work without slipping and falling off the glass surface. It also has a built in artificial intelligence that can calculate the glass area automatically, supposedly resulting in the most efficient route to clean, according to its calculations. Is this the writing on the wall for window cleaners? Or will it require an endless supply of batteries to keep it working? Who knows? Perhaps the next version will be a fully working android using the latest water fed pole system. Now that surely would signal the end of your friendly neighbourhood window cleaner! Need another reason to avoid cleaning your own windows? MSN recently had a story about a 97-year-old granny who became suspended 35 feet above the ground after she slipped while cleaning her fourth-floor windows. Fortunately she managed to grab on to an externally mounted air conditioner below her window to break her fall. The incident happened in Rivne in Ukraine where grannies are obviously tougher than old boots! With her foot wedged into the air conditioner’s bracket, the old dear managed to hang on for thirty minutes until help arrived. Heres a video that captured the rescue procedure. A recent report in the Shropshire Star reported that a window cleaner used his job to search for houses to burgle. Obviously this is a very rare occurence, but can you be absolutely sure that your window is trustworthy? Its obviously a concern for anyone who is seeking to employ a new window cleaner for the first time. “The 29-year-old is on trial at Shrewsbury Crown Court and denies two counts of burglary, one count of theft and one count of perverting the course of justice. The jury heard how on October 10 last year two homes in Waverley in Woodside were burgled”. “Mr Philip Beardwell, prosecuting, said in the burglary on the first home car keys and an Accurist watch, tobacco, a camera and a telescope were stolen. The car keys were then used to take a Ford Focus car from the drive”. This type of incident should never have happened, and it’s extremely difficult for a houseowner to judge who they can trust when faced with the task of choosing a good, honest and reliable window cleaner. To make it easier for the customer, QWC ensures that window cleaners we recommend are professional and well established companies who have either many years of trusted service and/or have invested large sums of money into their business to provide a quality service for the customer. We also make sure that our network of cleaners meet strict quality guidelines before they are passed on to new customers.